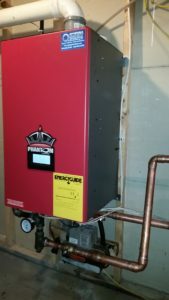 Way to kick off the heating season with this 95 % AFUE tankless modulating hydronic heating boiler by triangle tube. Top of the line brand / equipment. And they don’t pay us to say that. 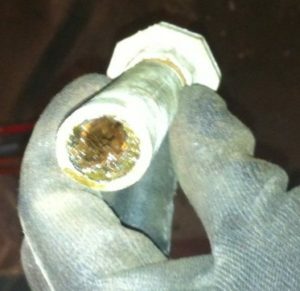 A call for no heat on an older high efficiency boiler showed that it was not repairable. Only option was to change it out. That brand no longer existed so we and customer came to a conclusion that a Crown Phantom 93% boiler is the best solution to the problem. We were able to install it next day and every one was happy. 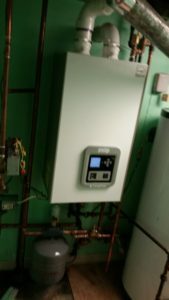 Below is the picture of the boiler as well as a voicemail from the family that are now very happy campers. If you own a house 60 years plus old, please pay attention to the water pipes. At certain time period a lot of houses were built with galvanized piping. 60 plus years later those pipes are extremely corroded, and get clogged with rust and debris. I really suggest to get rid of as much of these as possible. Pictured below is a small section of this pipe. You can see how rusty and filthy that pipe is. Oh did I mention that these pipes are very prone to leaking? One of the options for potable water piping is polyethylene, also known as PEX. 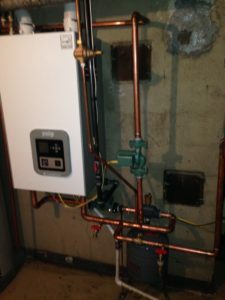 It has tons of advantages over other piping including copper. 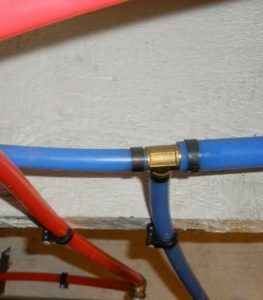 PEX piping is flexible unlike any other piping and since it is non metal it will not corrode. Due to it’s great flexibility it is more resistant to busted pipes due to freezing. Also this piping is available in red and blue colors to let you know which pipe is hot and cold. 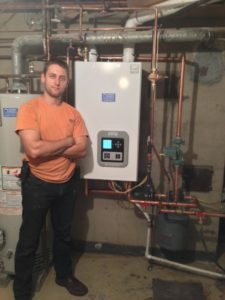 What is a heat pump you may ask? A heat pump is an air conditioning condenser unit (the one outside) that has built to have the ability to work in reverse. Have you ever come up to the condenser unit in the summer and felt how hot the air coming out of it was? Well that air can be harnessed for heating your house. Heat pumps operate quite efficiently in mild temperatures and are more efficient than gas or electric heat. However when outdoor temperatures approach freezing mark, heat pumps drastically lose their efficiency. 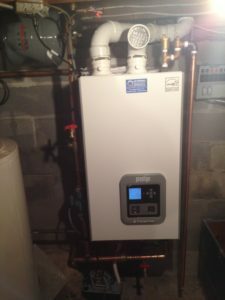 Typically a heat pump is used with secondary heat such as a gas furnace or electric heat to give you all year climate comfort. 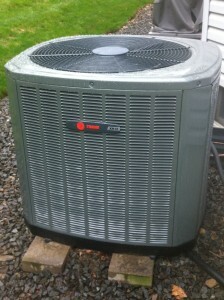 If you currently have forced air heating and cooling and considering an upgrade, a heat pump is an excellent choice. 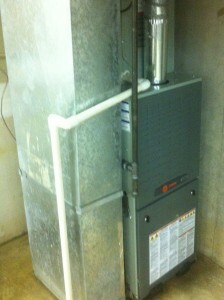 Below are pictures of a heat pump installation we did a couple of weeks ago.